www.photomacrography.net :: View topic - How can I harvest and adapt a focus block? How can I harvest and adapt a focus block? Posted: Thu Jan 29, 2015 5:14 pm Post subject: How can I harvest and adapt a focus block? If I knew a good answer to this question, I would make it a FAQ. But at the moment I don't, so I thought I'd see if I could prompt other people to provide one, or even better several. Here's the motivation for the question. Our list of setups is loaded with rigs that utilize a microscope focus block. We have a separate thread "Nikon , Olympus, Meiji, Swift Focus Blocks & Setups" that now runs for 9 pages. But after fairly carefully skimming all this material, I have only noticed one setup in which a focus block that was initially integrated into a microscope frame was completely separated from the scope base and arm and then used as a separate unit. That setup is HERE (pictures #3-5), utilizing an external "U-brace" to hold the block in position. Are there other setups that have been built by cutting apart a microscope that had an integrated focus block, and if so, how was the block fastened into the setup after the cutting was done? How. You sure the question shouldn't be why? I'm seldom sure about anything. However, it's been called to my attention that the Bratcam was actually constructed using this method. The block as integrated into the Bratcam is shown at http://www.photomacrography.net/forum/viewtopic.php?t=8247, and in a field setup at http://www.photomacrography.net/forum/viewtopic.php?t=12722. And the reason I said that I would post it as a FAQ is that just this month I've received two emails asking exactly that question. Would you care to expand on your thoughts? 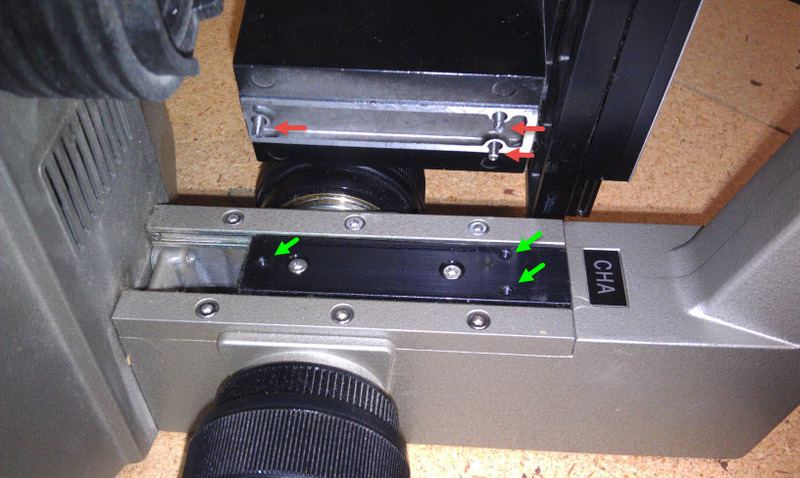 Very quick and easy, though the attachment of the arca quick quick release clamp may be specific to Olympus BH/CH models (I had to do it slightly differently with my CHT vs the other CHx model in the example). Cutting: Gembros particular model and method required zero cutting of microscope limbs. For my setup I had to cut part of a condenser lens mount. MUCH harder than I thought it would be. A hacksaw blade, 2 multitool blades and a sore arm to cut maybe 1/3" thick 2" long piece of metal. Advice on cutting these things would be appreciated as I'd like to cut off the main arm that holds the objective turret. U Bolts: Is there some cultural divide where flat topped (bottomed?) U bolts are available in the UK but rounded ones are dominant in the US? I need to find the right size somewhere or order them from the UK. Right now I have the microscope block mounted on an x-y cross vise - which also provides some ballast but makes for an over tall setup. Finding a good block: There are many threads on this, but if you're building a faq, I think a list of nice older microscopes with good blocks for macro would be helpful to maintain (it is without a doubt a FAQ). I think that would include Olympus BH/CH, Nikon Labophot, certain specific Leica models, and ?? Price is a big factor too. I'm sure this is not the elegant integration type you are looking for, but it is a very quick and effective way to get a focus block working in a macro setup that requires (as I can attest) virtually no mechanical skill. Though it will need refinements, I've been very happy with the result. For my setup I had to cut part of a condenser lens mount. I don't understand. On my CHA, the whole condenser block removes from the focus block with three cap screws. What's different about your rig? First because the microscope should also have a perfectly valid xy control for fine positioning the sample. It might need modifying but its solidly held where it is. Then the bulk of the structure is fuctional with just the head in the way. Hack off the head and bolt a vertical assembly to what's left to add more vertical coarse adjusment and your done - the guts of a heavy duty macro bellows should do. Not that I did ether of those myself. I kept the head by mounting the optics to the side and decided to fudge the optics to more or less parafocal to avoid the need for more coarse focus. Point being that a microscope is mostly a great big lump of structural metal designed to hold items at various points with no movement right down to the micron level. Keep any additional structure as short as possible and bolted directly to it and the job's well done. Rik, I haven't mounted a focus block myself but as a mechanical engineer, I could offer some design suggestions for mounting, having looked at a few. It'll have to be tomorrow though as it's past midnight here! Rik - as in GemBro's example, I left the condenser block on the microscope body. On his particular model, he removed the mini-rack that holds the condenser diaphragm and was able to use a convenient flange on the condenser block itself to bolt on the arca clamp with no drilling or tapping. On my CHT, the area were GemBro placed his arca clamp bolt was too narrow and didn't have the same flange. So I left the condenser slider part on and sawed off the condenser ring that is part of it. The slider has a flange at one end I could bolt onto, and it was easy enough to fix the slider in place. No drilling or tapping that way. A little more kludgy, but easy. That sounds like a very interesting setup. If you'd like to post some pictures and a description, I'd be delighted to link it into the reference list in our FAQ thread. That list already references several options for utilizing a microscope base more or less intact, but having more examples is always better. I'm sure this is not the elegant integration type you are looking for, but it is a very quick and effective way to get a focus block working in a macro setup that requires (as I can attest) virtually no mechanical skill. Quick, effective, and requiring no mechanical skill fits very well someplace in the set of information that I'm trying to collect here. You've probably noticed that one of my mantras is "There are tradeoffs." The map of possiblities is very large. What I'm looking for here, I think, are little packets of information that say "given these resources, here is something you can do; given these other resources, here is something else". All contributions will be gratefully accepted. Thanks for the further information about your setup! The Bratcam is the most famous and arguably the most refined of those, so another way of thinking about this thread is along the lines of "How can I build something like a Bratcam if I don't know anybody like a Don Wilson?" Rik, I took Chris S.'s Bratcam idea and went a similar route. A breadboard was lost by UPS almost two months ago, but another is finally on its way and after receiving it, I will take some pictures of it. I am in need of a similar setup of such Bratcam because I must take incremental shots all around the specimen that I am modelling. I'm posting because, to answer your proposed though about how to build a Bratcam without a Don Wilson, 3D printing is the route I took once aluminum pieces became too expensive. The plastic holds well and after a few hours on a CAD program (learning curve), I was able to send three separate files to a buddy who owns a 3D printer (two Makerbots) and had the pieces the next day. I needed a plate to mount a focus block onto a vertical pole mount, a circular piece which slides into the turret neck and on which is mounted a linear stage, and a smaller plate which is then mounted on the same linear stage on which is mounted a rotary stage. Given, everyone doesn't have a 3D printer, there are sites which will print a file sent to them, and there are many opensource CAD programs, I'm sure. My point is that, if you don't know a Don Wilson and hard plastic will work for you, I'd say that 3D printing is worth the consideration. I only have a couple of examples, but the stage X, Y, or both, controls don't work if the microscope is layed down, because of gravity. Therefore for a horizontal rig, which I would generally much prefer, everything on a microscope except the focus block is likely to be in the way. Now that is a valid reply. A horizontal rig solves the problem of camera lenses extending under gravity and is more accessable for experiments in lighting. Vertical works best, in my mind, when there is a fairly fixed and detailed project laid out and optics will not include a 1x camera macro lens or the canon mpe-65. Thing is that modifying a microscope into a vertical rig is so much easier. A mitutoyo or two, a raynox as tube lens and you get top of the range results. So there is an answer to my why but it is a question that anyone planing a project should ask themselves. Building a horizontal rig that is mechanically stable is no easy task. As promised, here's a quick sketch of one way to mount a focus block. There are of course many ways to do the same thing but I think this would be fairly versatile and only requires hand tools (hacksaw, file, drill, tap, countersink / counterbore bit) and some readily available engineering materials. Aluminium should be a good machining grade (no high strength properties required) that doesn't stick to files and drills. Alternatively an engineering plastic like Acetal is plenty strong enough and easy to work with. I agree on your main point: vertical rigs are definitely easier to assemble, and anybody planning a project should be aware of that and plan accordingly. The issue about mechanical stability is not so clearcut. What microscopes are designed to do is maintain micron-level stability between the stage and the objective turret. As soon as somebody breaks that particular connection, say by mounting the camera on a copy stand and looking downward onto a stage extension or a harvested base and stage, then they're back to the problem of having a long chain of mechanical links between the subject and the lens. Having built both, my own opinion is that stability is actually simpler to achieve in a horizontal setup, where it's easy to use large stiff baseboards rather than thinner support columns. But certainly more bodging is required to get a horizontal setup working at all. As promised, here's a quick sketch of one way to mount a focus block. Thanks for the sketch. This is helpful, but having done a bit of drilling and tapping over the years, I have some worries about this particular case. I'm painfully conscious that the fundamental purpose of the focus block is to provide smooth movements at the micron level. To do that, the gears and tracks of the block are finely machined, carefully adjusted, and kept clean. Any machining process risks getting debris into the gears or tracks. So, the worry I have with "drill and tap" is that, as shown, those operations involve penetrating the cavity that holds the already assembled gears and tracks. That being the case, I would like to hear more about how to avoid damaging the block as it's being harvested and adapted. I love this community! 3D printing is not an option I had expected to hear about. I will be very happy to learn more, as you have a chance to post it out. I have looked through the repair manual (a luxury I don't often have) and see that the focus mechanism is built into the casting. I was looking at a Leitz stand where the focus block is a self contained thing that screws onto the stand. I wouldn't try removing the paint on the back face of the stand as it will be epoxy powder coat and very difficult to get off without making a mess and as you point out, risk getting debris in the workings. When you have done that and it is cured, you will have a convenient clamping base for sawing off the top of the stand. For this I would use 2" wide paper tape to cover all of the focus mechanism and stuff the inside of the casting with kitchen paper and tape. I have done this often to avoid contaminating parts while drilling or cutting. I think this should make a nice clean job. I would use aluminium for the base and not Acetal as the Loctite is not for plastic. If I were doing the job, I would take the focus mechanism out and service it as any hardened bits of grease can cause problems with stiffness and irregularities in the movement, but then I like doing things like that!